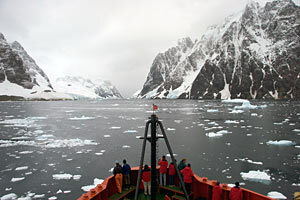 The icebreaker Laurence M. Gould noses through the LeMaire Strait in Antarctica during a Dive & Discover expedition in early 2006. Photo by Kate Madin, WHOI. Most people know that Antarctica is the coldest place on Earth, but did you know it is the world's largest desert? That huge volcanoes can be found here? Or a lake the size of Lake Ontario is locked beneath the ice? Discover what else you would find in Antarctica.